President Mahinda Rajapaksa predicted that the United People’s Freedom Alliance (UPFA) would form a stable Government at the conclusion of the April 8 parliamentary elections in line with the people’s expectations. President Rajapaksa made these observations addressing UPFA candidates for the Parliamentary elections at President’s House in Anuradhapura after all candidates made a pledge before the President to commit themselves to a free and fair election. The pledge was made following religious observances by the candidates under the President’s patronage on Saturday. The religious observances followed the ceremony at President’s House signalling the UPFA campaign launch for the general elections, where Prime Minister Ratnasiri Wickramanayaka and all UPFA candidates participated. Addressing the candidates after they made their pledge, President Rajapaksa reminded them that the people had kept faith with the UPFA on a continued basis since 1994. The UPFA had always kept faith and had taken steps to uphold the people’s franchise, he said. “We never subjugated the path of democracy. We did not believe in alternative routes and did not mislead the people by holding bogus referendums. This is why the people trusted us and continues to trust us. You should ensue its continuity,” he noted. The UPFA, the President said is a combination of many political parties and derived strength from its diversity. The President said the UPFA on this occasion was contesting all electorates from Dondra head to Point Pedro. The President however cautioned the candidates not to give false promises or get embroiled in bitter battles in search for preferential votes to get elected. “Tell the truth. You can take a leaf out of the Mahinda Chinthana in this regard,” he added. President Rajapaksa also emphasized the need to uphold party discipline and cautioned the candidates about husslings for the Manape. The President while emphasizing that the people’s free will should prevail, cautioned that any breach of discipline would be dealt with severely by the party General Secretary. President Rajapaksa called on the candidates not to force their will on the people, but instead give due respect to the public opinion and take examples from that. He said the elected candidates should represent the public opinion and should give voice to it within Parliament. President Rajapaksa also cautioned the candidates not to seek extra comforts or elevate themselves to a higher pedestal at the expense of public vote. All candidates promised to work together disregarding all differences to safeguard the sovereignty of the Motherland and to steer it towards prosperity. My goodness how could this man fold his hands and look up when he has so much of sin in him. If he is human he will not be able to meditate, pray, eat or sleep for his abuse of power in every sense. We await the Act of God. When I look at this picture it makes me sick to the core. He is reviled and hated. PLEASE DONT ALLOW SARATH FONSEKA TO BEAT US IN THE GENERAL ELECTIONS! A true leader of the soil looking to the skies for inspiration. The enormous sacrifices made by the Rajapaksa family in emancipating our motherland (20 million people) from the clutches of terrorists are unparralelled in human history. Mahinda, the leading human rights lawyer, kicked around by feudalists in the SLFP, clinging on to a dear political life and eventually became the President against all odds opposed even by the party leader! Gotabhaya, the long serving military officer, retired and pursued a brand new career as a Computer Operator in the US only to sacrifice all his aspirations to serve his motherland in emancipating its 20 million citizens from the clutches of suicide bombers. So did Basil and Chamal, all sacrificing their own callings to serve Sri Lanaka. The story continues in hundreds of other instances where cousins, uncles, nieces and nephews of the Rajapaksas have given up their life interests to serve in critical areas such as parastatals, public service, cultural and social organisations. The Rajapaksas are not stopping; now they drag the young man, Namal into this business of leading the country, sacrificing his own aspirations and objectives and career. What greatness. Gothabaya and Basil, the leadership they provide. For example, when Retd Gen Fonseca was hoildaying in China in the last days of the war, Gothabhaya took direct control and finsihed it off once and forever. When the Elections Commissioner was stressed out after the recent Presidentila elections, unable to decide on the winner, Basil gave him a hand. The Rajapaksas are a new brand of leaders and hope Namal will accept the call of the nation and continue providing leadership well into the oncoming decade. 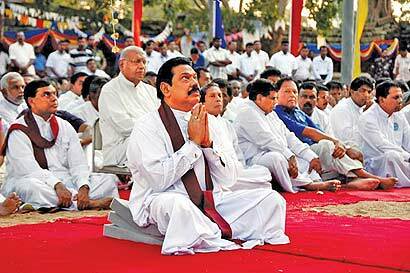 To the Rajapaksas, I salute with humility. OKKOMA HORU MINIMARUWAN STREE DUSAKAYAN PANSAL AWITH. SADU SADU SADU.